*I received this product from the Dial brand to try in exchange for an honest product review, all opinions expressed are truly my own. 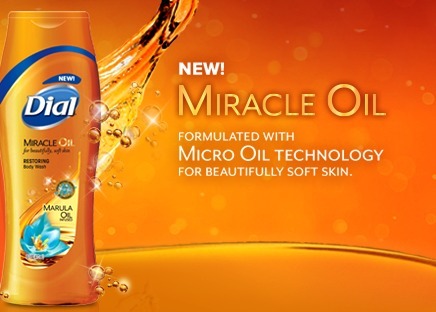 So thrilled to get to try NEW Dial Miracle Oil Body Wash. It is everything you would expect from Dial for high quality skin care. I figured this would be really good for my very dry skin. And I was right. This is a wonderful moisturizing soap that promotes healthy skin. My skin is so soft and revitalized after only the first use. Dial Miracle Oil Body Wash is a restoring body wash that has a rich, foamy lather. It really feels great on my skin. It leaves my skin feeling smooth and pampered. And the scent is very luxurious and unique. Smells fabulous. I also love the way it rinses extra clean leaving behind no residue on my skin. This is truly a whole family body wash. It is gentle, hydrating, and perfect for everyone. My kids and my husband are as impressed with this body wash as I am. And that's not always an easy feat in our household, finding something everyone likes can be a challenging. We really love this body wash and definitely recommend it. Feel free to check out Dial on Facebook and Twitter. Enter to win your own bottle of Dial Miracle Oil Body Wash!